This past week was quite a week. You know, the ones where the complications reach an almost laughable level? Where your husband is traveling, two of your three kids are sick, your roof is leaking (in three places), your car is in the shop (for the fourth time in three weeks), you have major renovations being done to your home (that prohibit your children from playing outside), and sleep is practically non-existent. Wait… you mean not everyone has weeks like that? And this DIY eucalyptus wreath may not bring world peace, but it gave me a little creative quietude and makes me smile. 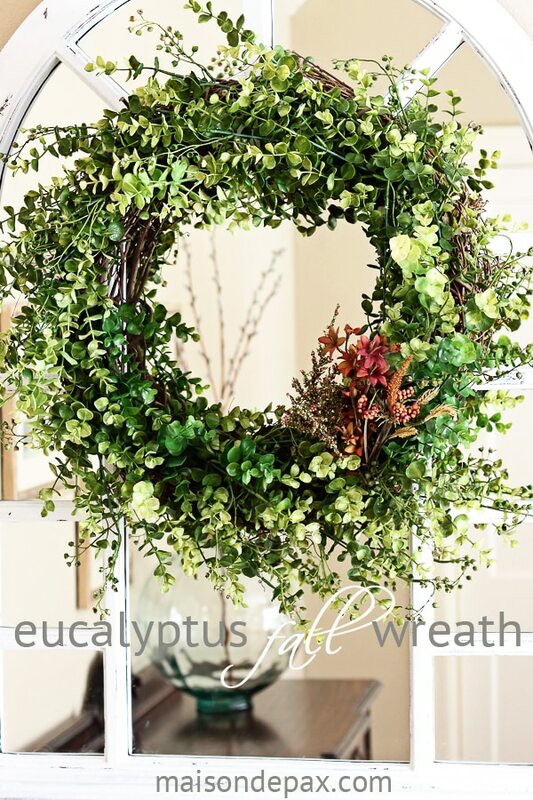 Natural eucalyptus wreaths easily run at least $75. I considered trying to make or buy a dried one (or a fresh one that I let dry), but I decided I wanted one that would really last. And if I want to add some eucalyptus scent, I could always add a few real sprigs into the mix. 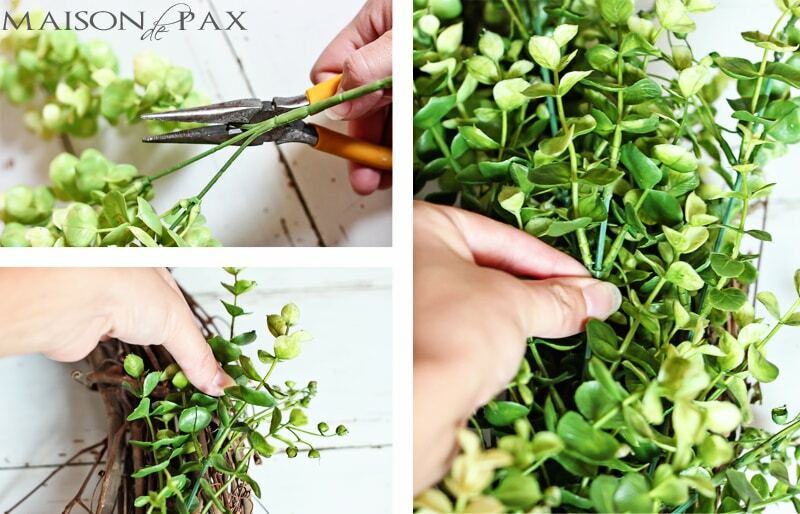 Adding embellishments is so easy with a full wreath like this. Making it was a snap. 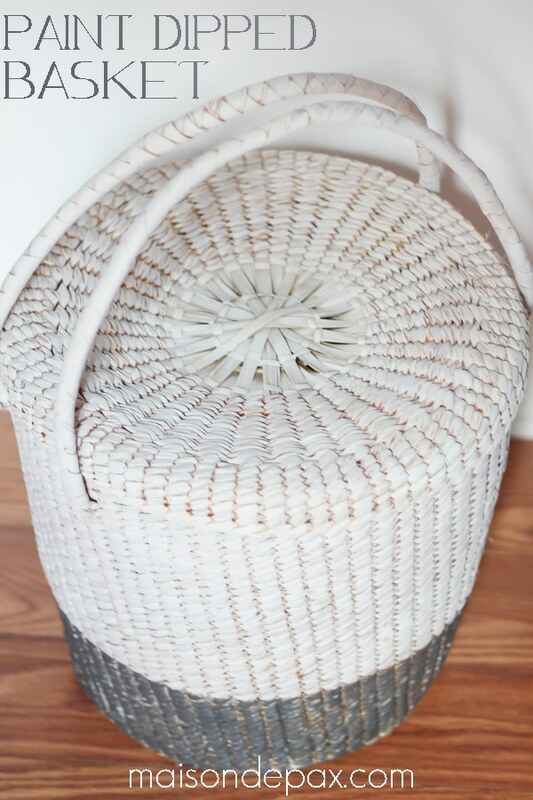 I either already had my materials or purchased them with coupons at Hobby Lobby, but if you prefer online shopping, I’ve linked similar products on Amazon below. This post contains affiliate links for your convenience. Click here to read my full disclosure policy. 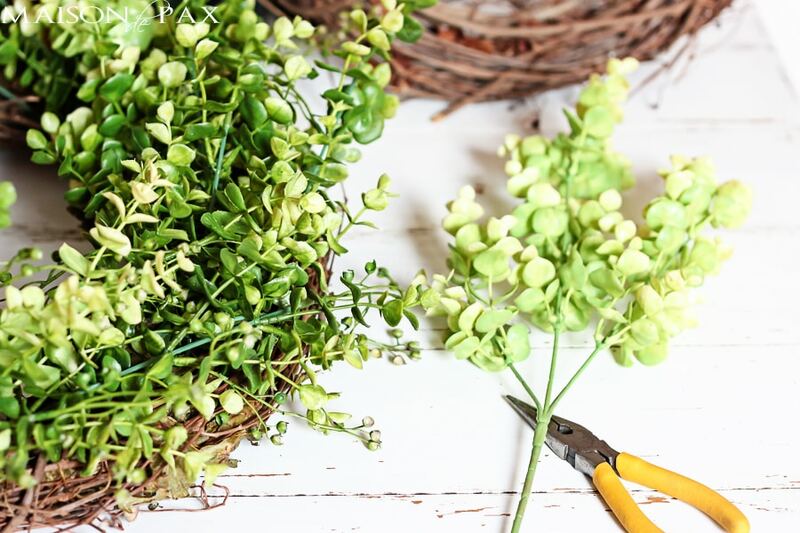 I snipped the individual stems from the main stem as far down as possible, then inserted each stem individually into the grapevine wreath, always facing them in the same direction. In one place, the sprigs seemed to be a little too wild, so I secured them in place using the floral wire trash bag tie. I kept going around the wreath until I was pleased with its fullness. The mixture of large bunches and small bunches from my craft store were to bring a little more variety into the coloring of the leaves (since they offered different colors in the different sizes). I love the natural element the color variety brings. And the best part is that by catching a 50% off floral sale, this entire wreath cost me just over $20. 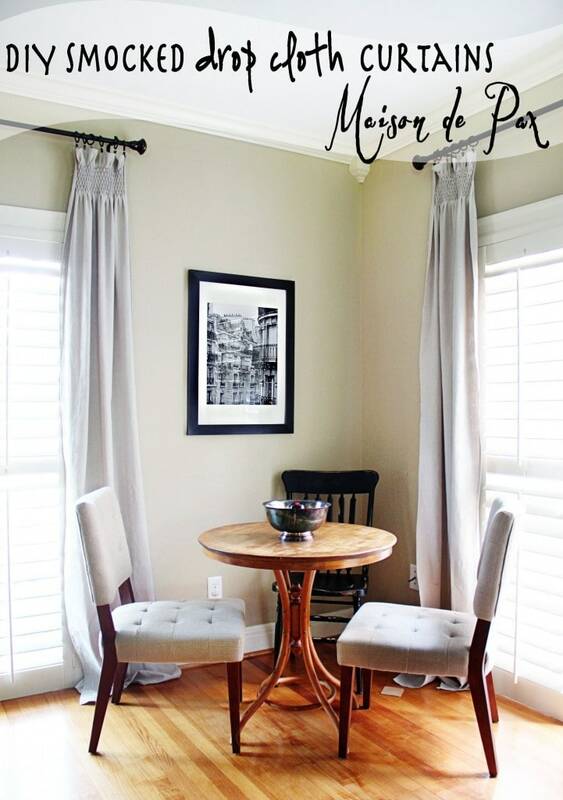 And I’m thrilled about the year round decorating possibilities. With just a little touch, it becomes a gorgeous fall masterpiece. All I did was stab some fall embellishments into the wreath, no real attaching necessary. And a red ribbon would be perfect for Christmas. A few white or colorful flowers for spring. The possibilities are endless. For now, though, I’m enjoying its fullness and the touch of fall beauty. What do you think? Could you enjoy this throughout the seasons? I read astrology posts. I don,t put much faith in them . I find them amusing, however, they have all been talking about mercury bei g in retrograde and that isnot good. Mercury will be in retrograde until the 25th of this month. My daughter has had a very bad week as well with all sorts of annoying problems. I guess there is something to be said about the alignment of the stars!!!! Glad you had time to make the beautiful wreath. Just remember, this too will pass. Ha! I’m so glad I’m not alone, Pamela! Hope you get plenty of time to create amidst the chaos!! Thanks for the idea it turned out beautiful. 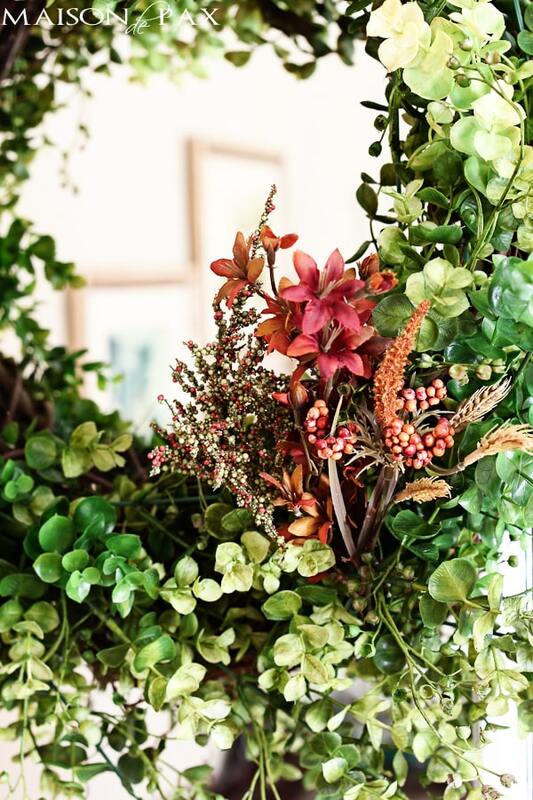 I absolutely love the wreath, the variability in color and textures, the air-i-ness (is that a word? ), the looseness. If you had not told me it was faux, I would believe it. The first time I saw it (last week?) I thought it was fresh or perhaps dried, but never “artificial.” I’m sorry to hear about your bad week. With me, doing something creative ALWAYS seems to soothe my soul. I wish the same for you. Have a better week. That should be “would NOT believe” it. I’m sorry about that. Perhaps I’m not having such a good day either. Bless your heart. I hope this week is better. The wreath is beautiful. Glad you could do this in the midst of your bad week. This is beautiful! 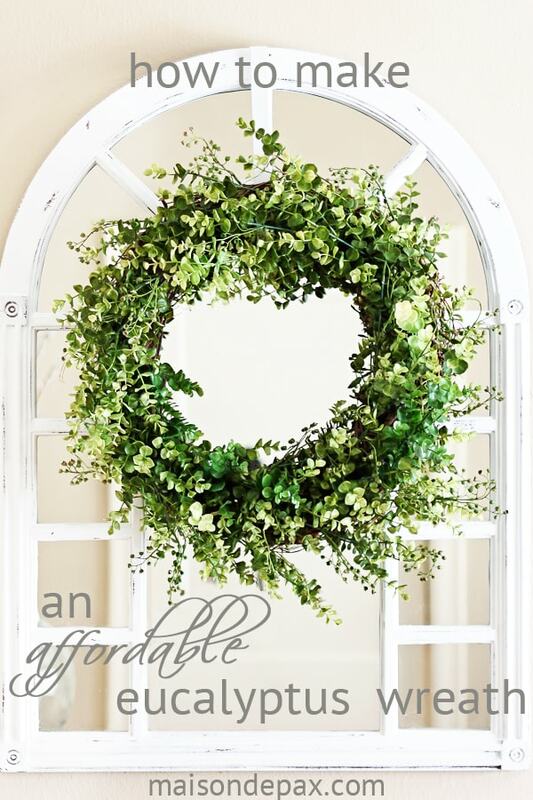 I love greenery wreaths but I usually hate the price tag. 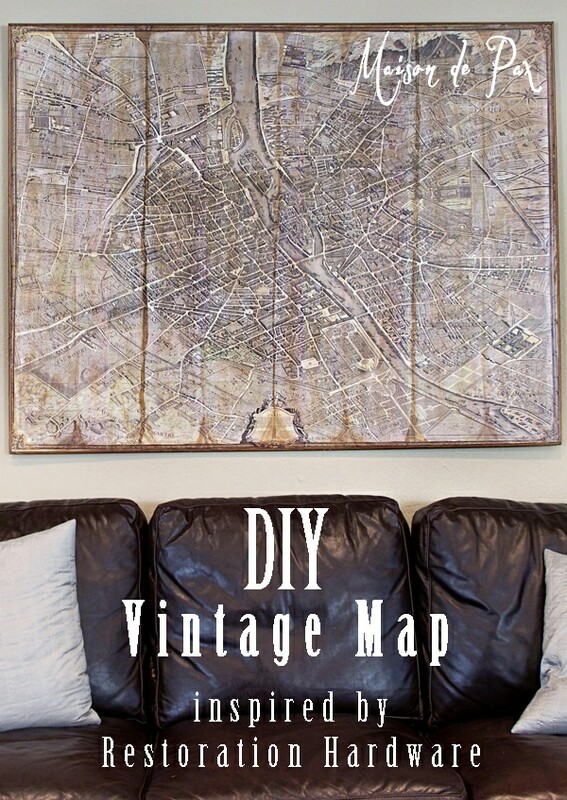 I may be making one of these very soon! Oh good! I’m so glad you like it, Courtney!! Love the wreath! Great job! I love the mirror behind it. Can you tell me where you got it? Thanks so much! Thanks, Kirsten! I love the mirror, too. It’s the Kenroy Home Cathedral Wall mirror (on amazon here), but I painted it white and distressed it. Hope this helps! Thank you so much, Eilis… It’s getting better already. 🙂 So glad you like the wreath! Visiting from Cozy Little House, but of course I follow you on instagram as well! Absolutely, Krista! I’d never get anything done otherwise. 😉 So glad you like the wreath. Thank you so much, Abbie! You’re so kind!! Beautiful! Just one question: did you secure the stems (other than the unruly ones) in any way? This is really beautiful!! 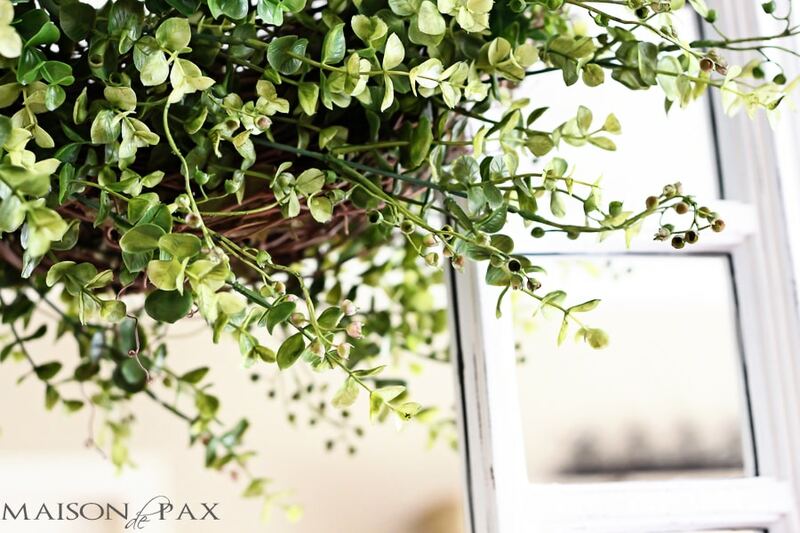 Thank you for sharing – where did you buy these particular eucalyptus sprigs?? Thanks! 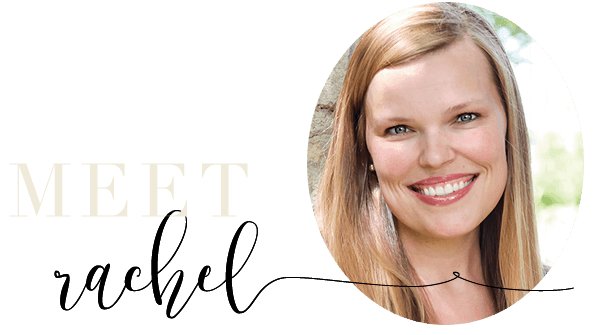 Thank you so much, Rachel! I purchased mine at Hobby Lobby when they were on sale. Hope this helps! 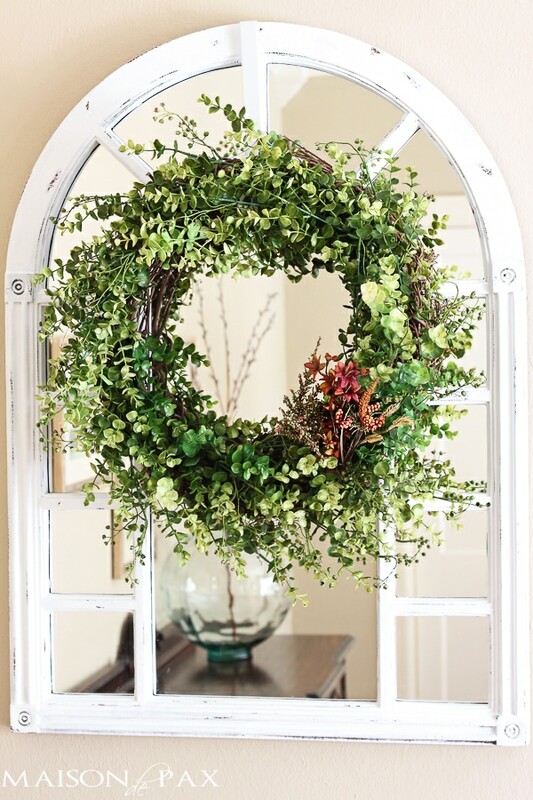 Love your mirror behind the wreath! 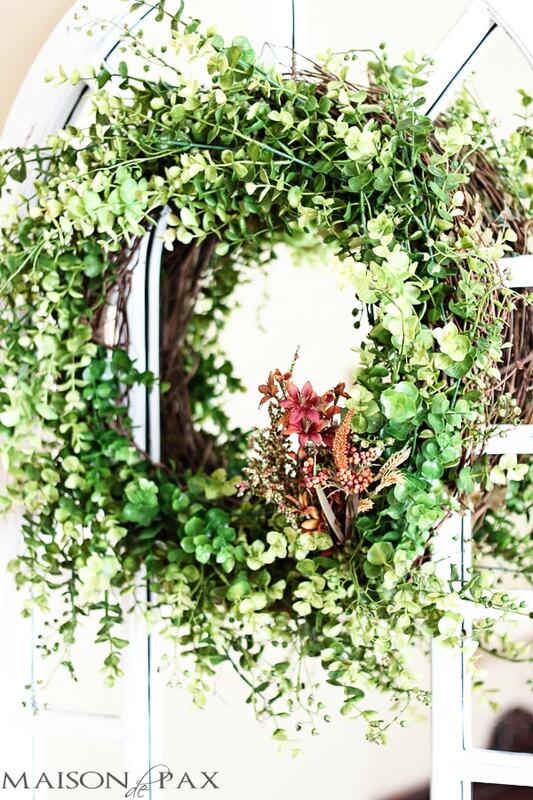 What a great stage for your wreath. Can you tell me where I might find one like it? Did you white wash it. Great idea. You’ll get a lot of decorating mileage with this wreath! Thank you, Cindy! The mirror is from Kenroy Home, and I painted it white (it started bronze). You can get all the details plus a link to the mirror in this post. Hope this helps! This is beautiful! 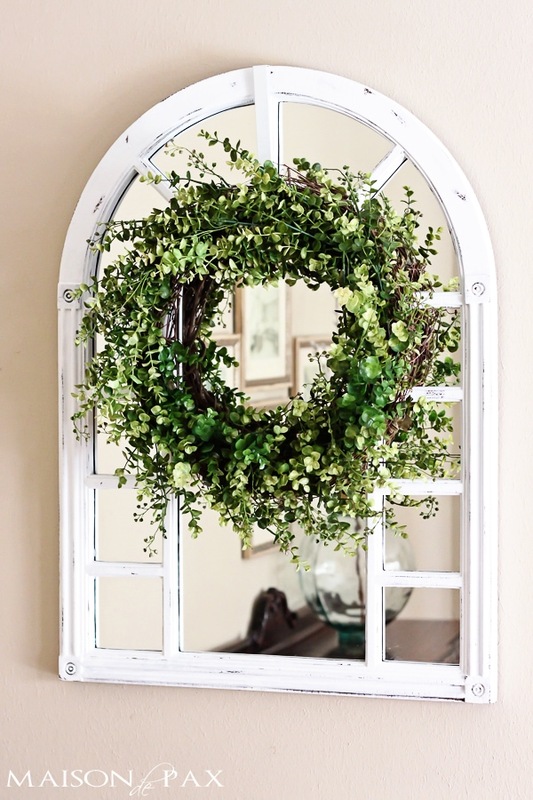 Silly question – how did you hang the wreath in front of the mirror? I’m thinking the peel safe 3M hooks? (not sure what they’re actually called, but the ones that won’t leave a mark after they’re removed. lol) Thanks so much! Love your work! 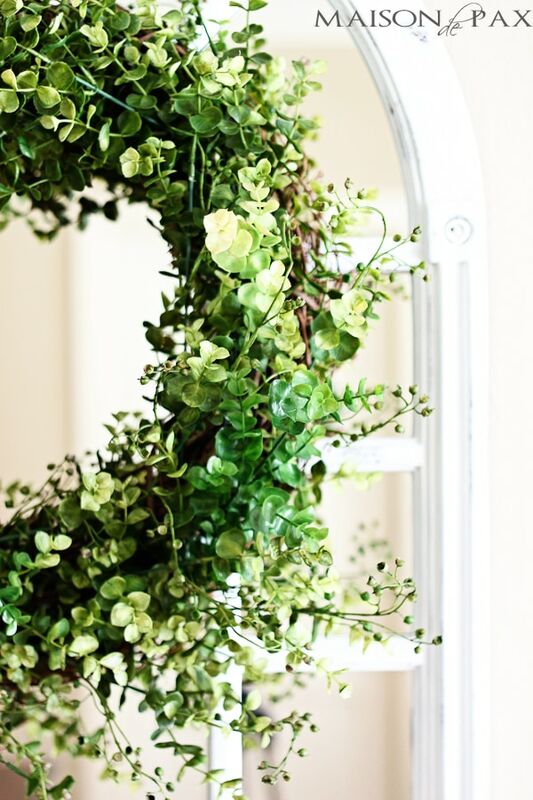 This is a beautiful wreath, but it isn’t made of eucalyptus. It looks more like boxwood.